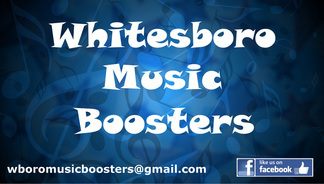 ​The Whitesboro Music Boosters Association is a 501(c)(3) non-profit organization staffed entirely by volunteers. We meet monthly during the school year in order to plan our activities. We run several fundraisers throughout the year, the proceeds of which are used to support music department activities, such as guest artist workshops, musical cast parties, senior scholarships, summer music grants, and uniforms. We also seek to promote involvement in music-related Whitesboro School District activities on the part of students, parents, teachers, administrators, and the public.